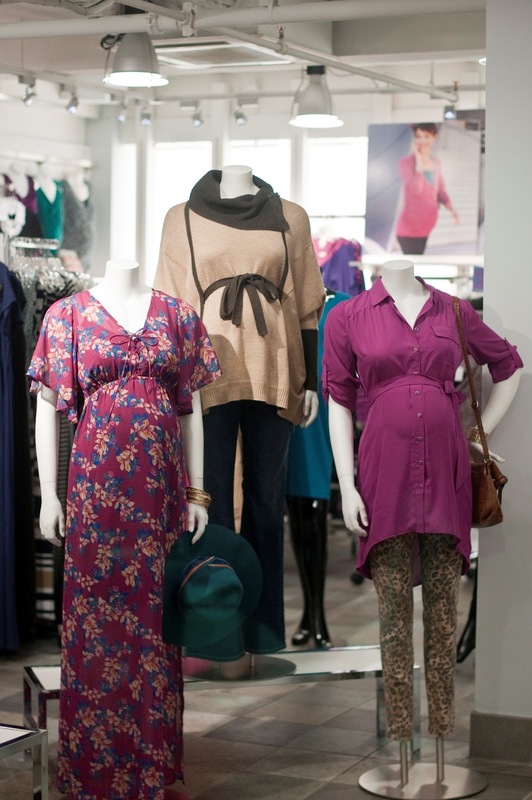 I recently got a sneak preview of the upcoming Jessica Simpson maternity collection available at Destination Maternity, Motherhood Maternity and select Macy’s stores on September 14th, 2012. The singer, actress and new mother is no stranger to designing clothing and accessories, but it was her recent pregnancy and the birth of her daughter that inspired this collection of fashionable maternity clothes priced $36.00 to $79.00. I wasn't sure what to expect, but walked away impressed and adding several items to my future shopping list. Full of breezy, everyday pieces, the collection is aimed at the modern mom-to-be who wants to maintain her fashion edge throughout her pregnancy (me!). Overall, the collection has a vintage 70s feel and is all about mixing patterns and textures for a cool, relaxed vibe. Vintage print tops, flowing maxis and form-fitting jersey knit dresses channel Simpson’s carefree casual side. Contemporary separates including jackets, blazers and chunky relaxed sweaters and essential knits round out the offering. Best of all, the styles are designed to accentuate the baby bump, while maintaining the ultimate in stylish comfort. My favorites from the Fall line include a dressy brown sweater (photo in the middle), especially since it looked like an outfit that I'd wear normally, not just when preggers. Pair it with some brown boots and you're all set for autumn, work and play. Jessica said, "This oversized batwing cape is so cozy. The drawstring waist makes it versatile enough to grow with your bump and still fit after you've had the baby." I also thought this dainty, long-sleeved colorful blouse was adorable, feminine and cheerful ($49). The holiday line coming out later this winter is even better with some soft and fashionable black, silver and gold threaded sweaters with faux fur, black pants and a stunning lacey black dress perfect for holiday parties. Cute! I could picture you in the dressy brown sweater just seeing it...before even reading your post!